The epc 111 / epc112 is a general purpose, fully integrated self-contained CMOS circuit family to be used in light-barrier applications. The chip contains a controller which drives an LED, typically an IR-LED. The LED is used in pulsed mode to increase the signal-to-noise ratio even when very strong sunlight is biasing the photodiode. It contains also a high sensitive photodiode amplifier and a signal conditioning circuitry to cancel unwanted environmental light including strong sunlight and pulsed light sources. The receiver is built around synchronous demodulator circuitry. Two output signals with different threshold levels are implemented in order to trigger the light-barrier output or to indicate light-reserve. 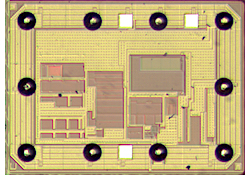 The chip also includes a power supply circuitry to establish all internally required voltages from one source only. It can be used as a standalone device forming the whole core of an industrial light barrier. epc110 can be used either as a standalone device with customer’s own configuration forming the whole core of an industrial light-barrier, or together with a microcontroller for more advanced applications. Up to 1’023 epc120 devices may be connected in series on one bus. Each device can be individually addressed by an epc100 chip which manages the 2-wire bus traffic between the microcontroller and the individual elements. Request the separate datasheets for implementation, usage and configuration information.